So without missing a beat, Eagle responded that it was Phillips who had dumped new stuff on the table when Phillips made his revelation that the files had been gotten from Junk. HENCE EAGLE HAD A RIGHT TO RESPOND TO THAT REVELATION and not doing that response 'before' was not an 'omission' that would have constituted a 'waiver' of his now claimed right to add the attorney-client realization... IN FACT his earlier 'omission' was due to Phillips' concealing the Junk-revelation and so HIS 'OMISSION' of the attorney-violation-complaining WAS NOT A MATTER OF HAVING WAIVED THE RIGHT TO MAKE THOSE POINTS. And so Phillips' basis for the Motion to Strike was invalid, Phillips' stuff was 'new' and Eagle never waived any right to challenge it before. That leaves the egg on Phillips face and leaves Gusweiler with NOTHING to validly use for his wanted CONTEMPT charges. CAUTION, It doesn't mean Gusweiler won't do it anyway, based on his past history of invalid decisions (in the case cited earlier where the Brown Countian taught math logic to the unwilling OSC on Ohio's faulty case law giving immunity to obnoxious, unrighteous civil servants)..
Now we wait.... but maybe there's a better back door for Gusweiler,,, WHAT HAPPENS WHEN THE FEDERAL COURT FIRES UP ITS GAVEL AND TAKES OVER THE BATTLE BETWEEN THE DEATH-SQUAD AND THE CORONER....??? However in this case, IMO, we may not want the case dismissed either. Though Dr Varnau and Eagle may want it over with. Consider this. If the case is dismissed AFTER Gusweiler's control is wiped away by the Federal Judge taking jurisdiction somehow [ theoretically removing the Death-Squad's TRO-stop-Coroner-action need for Gusweiler ], then yes we get the Inquest BUT IF THAT INQUEST DOES WHAT IT SHOULD BE ABLE TO DO, namely nail the evidence down that completes the Coroner's picture, TELL ME WHO IN THIS CORRUPT ENTERPRISE IN BROWN COUNTY'S LAW ENFORCEMENT IS GOING TO CHARGE THE KILLERS?? AND THEIR ESCAPE TEAM full of big state-connections?? Who's going to summon another Grand Jury? Who's going to prosecute? Who's going to judge? Where would Justice come from? WHEREAS, I might believe the District Attorney in the Southern Ohio Federal Court (Carter M Stewart being an out-of-state Democrat who's prosecuted drug and gun crimes when he was in California ) just MIGHT take custody of the evidence WHEN THE FEDERAL COURT -- complete with jury -- lays out all of the guilt and demolishes the lying IN THE TRIAL ON THE MERITS..... and EAGLE COULD DO IT..... he's excellent at merits and there are lots of defense merits...... Agreed? So now just what does it take to get to the finish line going in that direction..?? Some serious money on the Plaintiffs' side as well... Since Eagle has already filed his Answer as well as even his Motion to Dismiss, then (under court rules) the Death-Squad can't practically back out if the price goes steeper while the merits battle looks shaky... they can no longer just easily fold their tents and drop the case if the heat gets going in the Discovery process? First of all.... Eagle has the right to insist that the federal court "abstain" from involvement using the same Pullman case law that Eagle tried unsuccessfully in the Elfers case. He'd launch it again because, unlike the Elfers' lawyer (being smart enough to insist they were not challenging any Ohio law), Phillips' list of 'Counts' of complaint are all predominately matters of Ohio law....just cloaked in federal constitutional rights framework.... so either the Ohio law fails the constitution's needs or why is Phillips in Federal Court? Specifically, Phillips even uses the sort of phrasing used in ORC2744.03(A)(6) in describing their grievances in all the Counts 1-4. When you look at his paragraphs 83 to 99, (in their Amended Filing) Phillips complains that Dr Varnau was acting in bad faith, engaging in malicious abuse of her authority, and proceeding in a reckless and wanton manner to cause loss of property (property being the Death-Squad's reputation, professional career opportunities and such). and EVEN IF ANY OF THE EXCEPTIONS TO IMMUNITY IN ORC2744.02(B) do apply and no defense in that section protects the political subdivision from liability then the THIRD TIER OF THE ANALYSIS requires a court to determine whether ANY OF THE DEFENSES IN ORC2744.03 APPLY, THEREBY PROVIDING THE POLITICAL SUBDIVISION IMMUNITY ANYWAY. To sign the petition, let's stop the CFAA assault on internet connectivity. But signing is just our opening salvo because the government fear of the internet is raising its head, as Aaron predicted it would again, even after how soundly SOPA/PIPA and CISPA were defeated. Even Cispa's been reintroduced somewhere. The unidentified authorship of the bill being 'discussed' in the Judiciary Committee is so entirely a faulty law, as to make knowing or communicating with Anonymous equivalent to membership in a racketeering group, and such would carry penalties that rival severity reserved for mobsters. Other vagueness would allow you to be prosecuted for checking Facebook at the office, if that was against company rules. Racketeering-unjust parallels and extremely unbalanced thinking has to be stopped. This CFAA was misbegotten to start with, back in the 1980s, shows an extreme lack of knowledge of internet and computer realities, and should be trashed. It's not decent enough to fix. 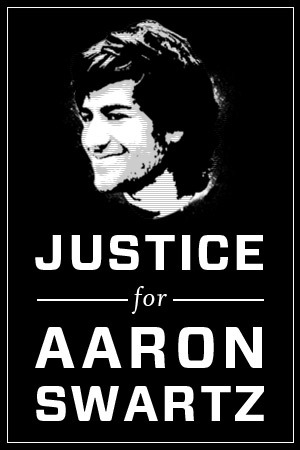 The current interest was supposed to fix it after they saw how it could, and was, abused, to target Aaron for his successful work against their previous attacks on connectivity, but instead this latest action has allowed the hateful ignorants to make it even worse.